With Halloween just around the corner, Nintendo decided to get into a spooky mood and released new, Halloween related 3DS home screen themes. One of these themes is based entirely around The Legend of Zelda. 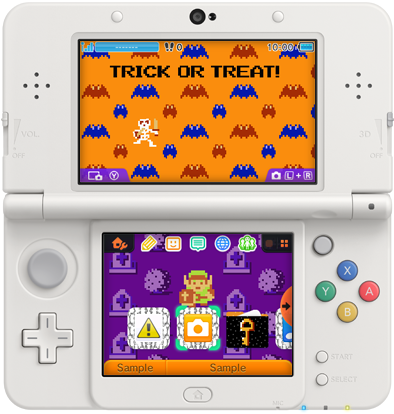 On the 3DS’ upper screen the theme features blue Keese and their more rare form, red keese, along side a single Stalfos toppped off with an orange background, purple highlights and large text at the top of the screen reading ‘Trick Or Treat!’ The bottom screen shows Link alongside several graves and tumbleweed, all in purple shades and surrounded by a monotone purple and orange highlights. The application icons are surrounded by what appears to be chains, and folders hold a texture detailing a key. All this is accompanied by a slightly remixed version of the original dungeon theme. The item is currently priced at 200 yen (€ 1.5 / $ 1.9 / £1.2). Check out the video above to see the theme in action!